Rihanna‘s a badass, right? Like, she has a tiny gun tattooed under her armpit and she sings about being “so hard” and shooting men. Rum pum pum pum eh eh oh oh? One of the many people who forgot she was a gangster with a Penguin-style umbrella arsenal called her family members “retarded” on Instagram. 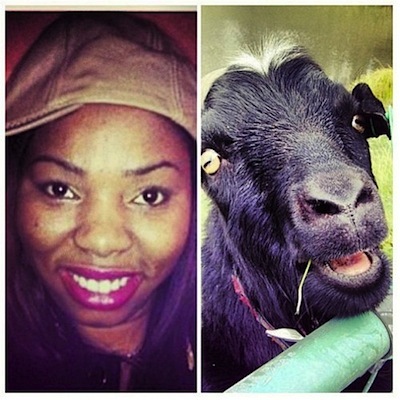 Rihanna noticed this and posted a photo of the user next to a goat, asking her millions and millions of Twitter and Instagram followers to spot the differences. “Can you spot the 3 things that are different in these pics? Chile, it’s time to privatize that account,” Rihanna wrote in response to ms_kasharna1, a woman who reportedly trolled her in the past by saying she looked “dirty” and needed to be punched by Chris Brown again. Not a great move. First, she gave the chick power by acknowledging that she chipped away at her not-so-hard exterior when she dissed her family. Second, everyone feels sorry for the goat girl now. They’re both bullies but Rihanna has 20 million people to back her up and ms_kasharna1 has 100 at most. Oh, THIRD she fought shallowness with shallowness when she should have just used words. Or ignored. Thatys whats u get when u mess with someone with millions of followers….. You get kicked in the balls ho…………. Bag.